What is district heating and cooling? 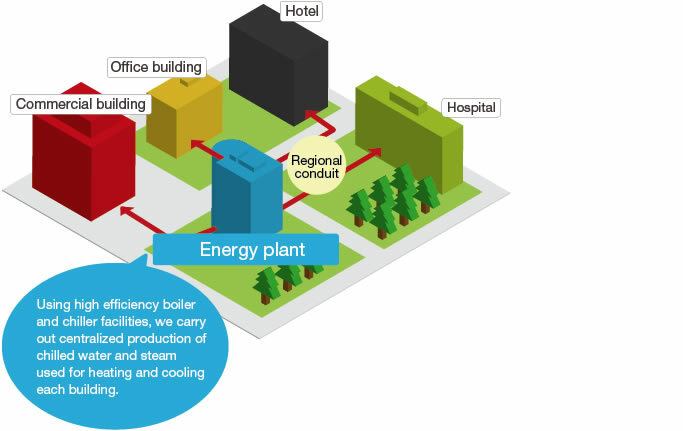 | Minato Mirai 21 District Heating and Cooling Co., Ltd.
Home ＞ For individual ＞ What is district heating and cooling? District heating and cooling systems are a form of urban infrastructure that is indispensable for establishing ideal, environmentally friendly cities. District heating and cooling systems are made up of one or several local plants that produce cold water and steam for cooling and heating a certain area and hot-water supply, and a network of supply pipes that deliver these around the clock to a number of buildings. By centralizing boiler and chiller facilities, these systems conserve energy by improving operating efficiency. They also play a significant role in environmental protection, preventing air pollution and global warming, thereby supporting the planning of ideal, efficient cities. Centralized management of boiler and chiller facilities also makes them effective energy systems from the point of view of urban disaster prevention. For all these reasons, in recent years district heating and cooling systems have been playing several important roles in urban development. As with electric and gas companies, district heating and cooling companies are regarded as public utilities in Japan, according to the Heat Supply Business Act passed in 1972. With the implementation of revisions to the Act in April 2016, the license system became a registration system. Under this system, those intending to operate a heat supply business are now required to meet certain requirements regarding qualification as a heat supply operator as well as registering the business with the Minister of Economy, Trade and Industry. Japan’s first district heating and cooling project started in 1970 at Senri Chuo in Osaka Prefecture. Today, there are 134 supply districts around the country. District heating and cooling was introduced in Yokohama in 1989 by MM21 DHC Co., Ltd., and it is currently provided in four locations in cooperation with three other companies.